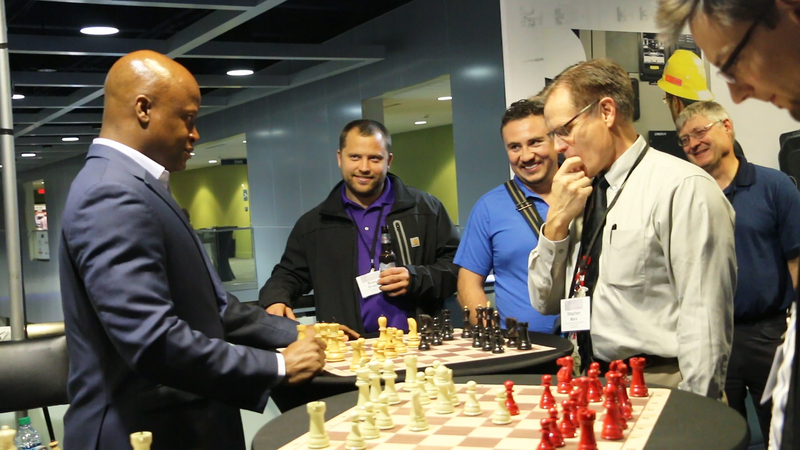 Grandmaster Maurice Ashley recently held a simultaneous chess exhibition at the Western Protective Relay Conference in Washington, USA. The event was a big success but how did this event become a reality? It all started with a message sent on LinkedIn several months ago. 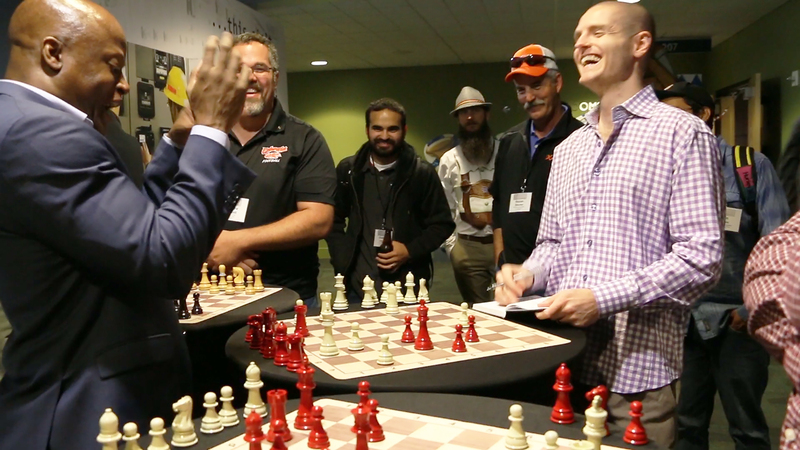 Right before Maurice promoted his pawn to get his queen back…everyone was loving it! Margaret Paietta, Chief Marketing Officer at Fischer Block, first contacted me back in February 2017 via the professional networking site, LinkedIn about recommending a grandmaster for a simultaneous chess display at a Conference. She had seen that there was a huge amount of chess in my profile and reckoned that I might have someone I can recommend for her upcoming event. The brief as I understood it was quite simple. Margaret and her team at Fischer Block wanted to conduct a ‘simultaneous chess contest’ with a Grandmaster in their booth to host an exciting event that would be appreciated by those in attendance. They were looking for a high profile and entertaining chess grandmaster who could not only play the game but connect with the audience as well. They also wanted to raise awareness to the exciting game of chess. They planned to continue this simultaneous chess exhibition into the next trade show, where the attendee who scored highest against the Grandmaster will be reigning champion until next contest, representing their college or organization from all around the world. Grandmaster Maurice Ashley posing problems for his opponent from the word go. Grandmaster Maurice Ashley was a natural choice for me. One of the founders of Millionaire Chess, GM Maurice Ashley, has been actively promoting chess for the past three decades. According to his LinkedIn profile, Maurice Ashley lives his passion. Through his love for chess, he not only made history as the first African-American International grandmaster in the annals of the game but he has managed to translate his love to others as a three-time national championship coach, two time author, ESPN commentator, iPhone app designer, puzzle inventor, and motivational speaker. Maurice has also been featured in one of the most watched chess videos of all time. His app, Learn chess! With Maurice Ashley, has been sold in over 26 countries and has received multiple community service Awards from City government, universities, and community groups for his work. His drive and enthusiasm always has him on the go. In the fall of 2011, Maurice toured 6 Caribbean Nations bringing chess books and technology to kids in the region. Maurice is a highly sought-after public and motivational speaker as well as chess promoter. Would he be able to make an April event? That was the big question for me. Here was a man who finalises many of his events months in advance. Would he be available? Regarding the upcoming event, Fischer Block would have a fairly large booth at an important Trade Conference held in Texas. The event, held in high regard by the leaders of the Electrical Power Industry would be run in the month of April. Attendees are professionals in a high tech industry, from over 35 countries worldwide. After much consideration it was decided that April was too soon to put together a successful chess event and instead the event was moved the event to October at the Western Relay Conference in Spokane at Washington State University, Oct 17 – 19, 2017. A few more back-and-forths was all it took and the rest is history regarding the event. The feedback from Margaret confirmed Grandmaster Maurice Ashley as an excellent choice for the chess event. The event was indeed a big success, and in their view, Grandmaster Ashley could not have been a better choice. According to Margaret, Maurice connected with the audience in a way few people could, balancing the precision of play on the board with banter and trash talking with the players. By the way, Maurice won every game but this came as no surprise to me. Though Maurice is now retired from competitive chess he is quite a strong player. The flyer to the event was sent just prior. The idea behind this was for the attendees to be truly excited and surprised with this opportunity and ultimately leave wanting to “practice up” for the next opportunity. GM Ashley engaged attendees in simultaneous chess; with one attendee he even played blindfolded. The grandmaster played the whole game without any sight of the chessboard which the spectators found really fascinating. The enthusiasm at the event was overwhelming, with attendees quickly lining up at this “surprise” event (no pre-announcement). Fischer Block had contacted a local chess association, Inland Chess Academy of Spokane Valley, WA. They provided the chess boards and pieces, and coordinated the logistics with Maurice. Their assistance was instrumental in helping the event run smoothly. 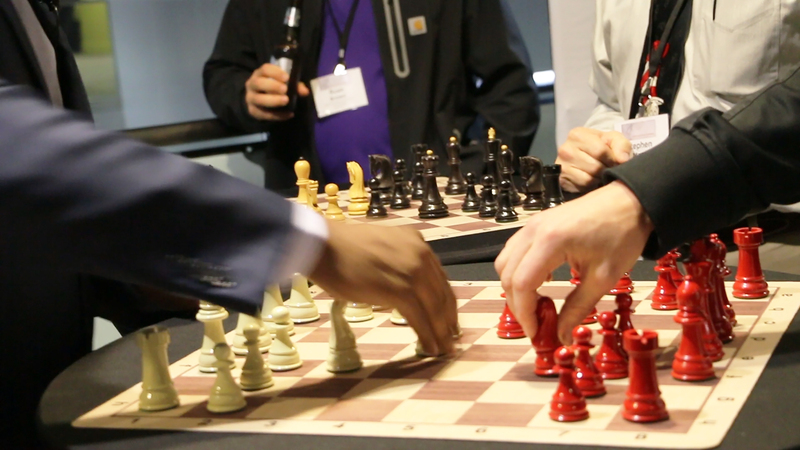 Fischer Block is having another simultaneous chess exhibition at another event at the DistribuTECH Conference, in San Antonio, TX. Jan 23-25th , in collaboration with the Kasparov Chess Foundation. 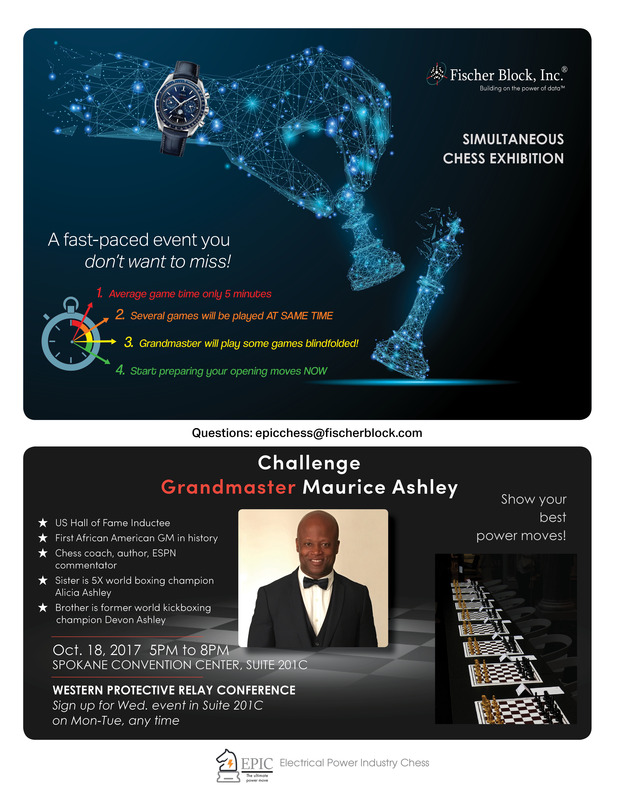 Maurice Ashley will be the Grandmaster at this event. Additional details forthcoming. At this event, we will track performance in a much more formal way, with a leaderboard showing the number of pieces won by each participant (and showing the company that each represents). Ultimately, we believe we will create great fun competition between contestants (and between the companies they represent) all in the spirit to promote people coming together to help the Kasparov causes and those of the sponsors’. Fischer Block helps improve energy reliability by providing early warning signs of pending problems on the electrical grid for industrial and utility customers. The company utilizes predictive analytics and machine learning as the basis of their algorithms to monitor and improve grid reliability. In many ways, very synonymous with the skills required in chess.